Drawing on the riches of the ocean to develop exceptional skincare products, experts in marine skincare and spa therapies Thalgo presents the Redensifying Cream; a fine and velvety anti-ageing moisturiser that restores a luminous complexion and fills the appearance of fine lines and wrinkles to reveal a smooth, youthful looking visage. 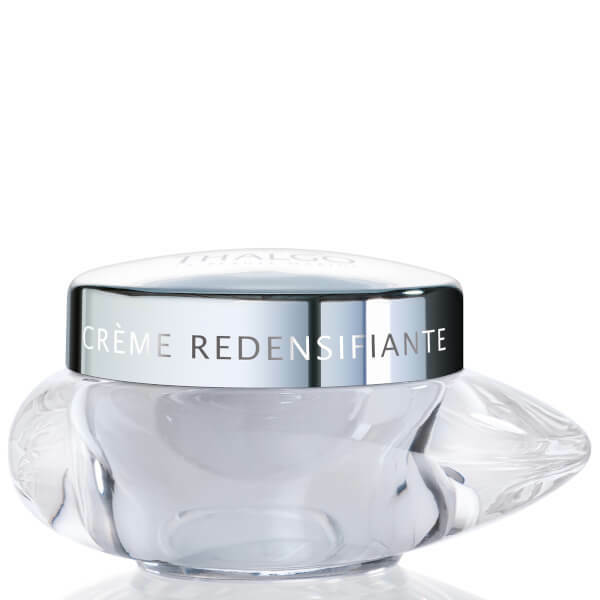 Fortified with the brand’s patented Marine Replenishment Complex made from Algae extracts, the cream performs firming, tightening and lifting action, promoting elasticity and plumping skin with vital moisture to lessen the look of wrinkles and lines, whilst a plant trio revives radiance. With repeated application, facial contours appear resculpted and skin flaunts boosted radiance. Aqua (Water), Propylheptyl Caprylate, Butylene Glycol, Diisopropyl Dimer Dilinoleate, Prunus Amygdalus Dulcis (Sweet Almond) Oil, Caprylic/Capric Triglyceride, Triceteareth-4 Phosphate, Cetyl Palmitate, Pentaerythrityl Distearate, Triethylhexanoin, Hydroxyethyl Acrylate/Sodium Acryloyldimethyl Taurate Copolymer, Alcohol Denat,, Cera Alba (Beeswax), Ascophyllum Nodosum Extract, Halopteris Scoparia Extract, Leontopodium Alpinum Callus Culture Extract, Helichrysum Stoechas Extract, Ceratonia Siliqua (Carob) Fruit Extract, Glycerin, Panthenol, Palmitoyl Proline, Parfum (Fragrance), Phenoxyethanol, Polyacrylate-13, Chlorphenesin, Glycyrrhiza Glabra (Licorice) Root Extract, Sodium Gluconate, Magnesium Palmitoyl Glutamate, Sodium Palmitoyl Sarcosinate, Polyisobutene, Sorbitan Isostearate, Polyacrylate Crosspolymer-6, Polysorbate 60, Ethylhexylglycerin, Tocopherol, Glycine Soja (Soybean) Oil, Sodium Hydroxide, Polysorbate 20, 1,2-Hexanediol, Caprylyl Glycol, Citric Acid, Xanthan Gum, t-Butyl Alcohol.